One of the ironies of CES, hosted here in Las Vegas, is that the largest and perhaps most spectacular gadget we could all be covering is nearly 80 years old, weighs 6.6 million tons, and supplies much of the electricity fueling the devices on display at the trade show. 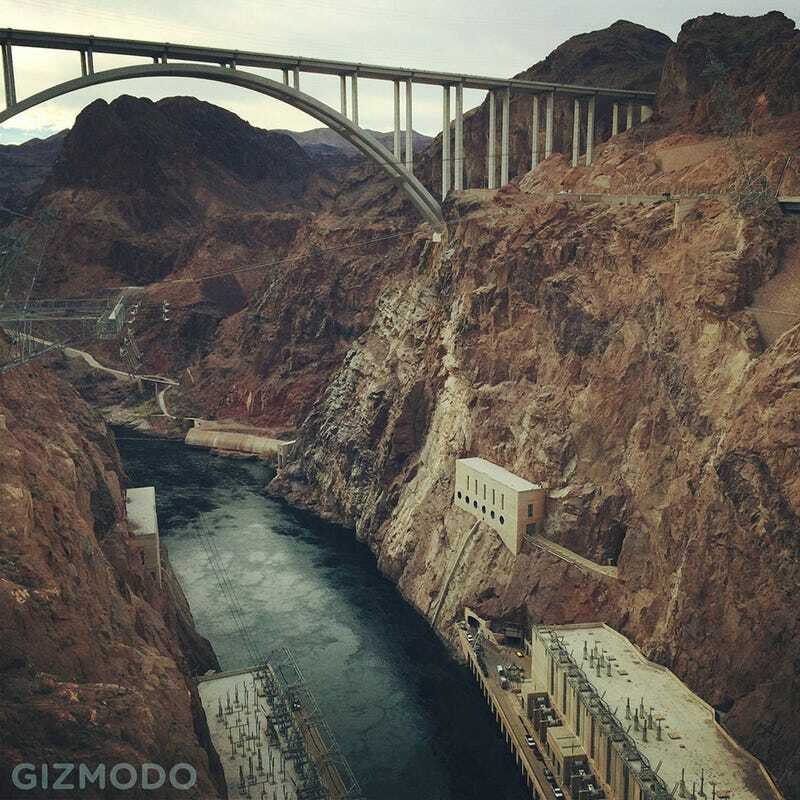 It's Hoover Dam, and it's been roaring with hydropower, a mere 45-minute drive southeast of the city, nearly since the day of its dedication back in 1935. Nestled in a canyon exactly on the Nevada-Arizona border, the dam straddles state lines and timezones both, holding back the colossal artificial reservoir and National Recreation Area known as Lake Mead. The entire flow of the Colorado River passes through the dam on its way further southwest, so every drop of water entering the Colorado watershed north of Hoover Dam is temporarily impounded here in a lake so big, our guide pointed out, it could flood the entire state of Pennsylvania to a depth of one foot. Of course, one of the most notable features of the lake is the so-called "bathtub ring"—the white, seemingly bleached rock around the canyon edge—created by minerals deposited during the lake's 1983 high-water maximum that nearly overtopped the dam itself. The bathrub ring thus represents not the lake's normal depth, but an anomalous year of particularly high flooding. Gizmodo took a quick trip out of town to see all this for ourselves, making the short drive southeast from Las Vegas to Hoover Dam for a tour of the megastructure's inner workings and a walk through the dark tunnels blasted through 40-million year old igneous bedrock deep below. We arrived on an auspicious day, our guide explained, as every turbine on the Nevada side of the dam had been turned off for maintenance, giving the main electricity generation chamber an eerie silence. This partial shutdown of the dam's Nevada-side turbines would not have been possible during the summer months, when electrical demand is simply too high to shut these turbines down. But the turbines on the Arizona side of the dam—one hour in the future, spinning on Mountain time—continued to work, generating power for the region. The split temporality of the dam—the fact that it exists in two timezones simultaneously and that you can walk between them on just a short stroll along the road atop the dam's upper edge—added an unexpectedly surreal dimension to the tour, as the electricity flowing away from us at the dam site was all coming from a different timezone; like something out of a Mike Mignola comic book, it was as if some bright electric fissure in time had been opened up here in a remote canyon and the resulting rift was a source of fuel for our western cities. In any case, the dam itself is both extraordinary and vertiginous, with a base 660 feet thick built from stacked concrete cells, like a cubist honeycomb, a mammoth wall of material that now gleams in the afternoon sun. In films of the dam's construction, gigantic buckets of concrete pass back and forth over the canyon on steel cables, looking not unlike mechanized heads in today's inkjet printers. It was a depositional manufacturing, operating at the scale of infrastructure, that seems to have presaged a future of 3D-printed concrete superstructures. In these old videos, the cables weave from side and side, and the dam stacks up—and up and up—beneath them. But the lake, as has been exhaustively documented elsewhere, is dangerously low; should the water levels continue to drop, Lake Mead will reach a condition known as dead pool, when the waters stored behind a hydroelectrical dam are no longer capable of turning the massive, 600-ton turbines inside the dam and thus unable to generate any electricity. The dam requires a minimum of 400 feet of water to achieve the necessary gravitational energy—the right weight and pressure—to make the turbines rotate, and the lake is already down to an alarming 480 feet in depth. This is already a hundred feet or so lower than the lake could be at this point in the season. You can read quite a lot about the dam elsewhere, including on the dam's own official website, but it's worth pointing out that you can trace the electrical nervous system of the dam away from this canyon nestled into the rock of the state border, up along the desert freeways, and trickling back again into the heart of Las Vegas and beyond, to the cities (and water pumps) of southern California. Like a body peeled of its flesh to reveal the inner veins and cables, its hidden arteries and wires, the electrical system sprays outward from the dam and over the rocky hills, as transformers become power lines, become relays, become the evening lights of the city on the horizon as you meander down toward the Strip. This sprawling net of power cables, bringing energy away from the dam and into our devices, is a fascinating labyrinth to drive beside and an interesting counterpoint to all of the consumer electronics on display right now here at CES. If CES is a celebration of gadgets, perhaps its ultimate example should be this behemoth wall of slow-cooled concrete holding back the waters from which our smaller devices' electricity was first spun.